Toronto, June 27, 2016 – The new IMFG paper, More Tax Sources for Canada’s Largest Cities: Why, What, and How?, released today by the Institute on Municipal Finance and Governance at the University of Toronto’s Munk School of Global Affairs, examines a dilemma that many large Canadian cities face: how should they pay for growing expenditure challenges and deteriorating infrastructure with a tax base that has remained largely the same for many decades? 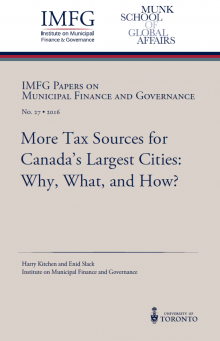 Contrary to the view of many city councillors and local taxpayers, the paper’s authors Harry Kitchen and Enid Slack argue that access to additional tax sources is entirely appropriate and likely necessary for Canada’s major cities to continue to thrive. Following an overview of the advantages and disadvantages of potential new taxes, they estimate the amount of money that might be generated from a city income tax, a city sales tax, and a city fuel tax in eight Canadian cities: Vancouver, Calgary, Edmonton, Winnipeg, Toronto, Ottawa, Montreal, and Halifax. “Cities around the world levy a wide range of taxes, including income, sales, fuel, and hotel taxes,” says Enid Slack. “It is time for Canadian cities to have access to some of those taxes as well.” According to Kitchen and Slack, a more diverse portfolio of taxes would allow Canada’s largest cities to achieve revenue growth, revenue stability, and fairness for taxpayers. Read the paper on IMFG’s website. Harry Kitchen is Professor Emeritus in the Economics Department at Trent University. Over the past twenty years, he has completed more than 100 articles, reports, studies and books on issues relating to local government expenditures, finance, structure, and governance in Canada. In 2013, he was awarded a Queen’s Diamond Jubilee medal for policy analysis and research contributions to municipal finance, structure, and governance in Canada. Enid Slack is the Director of the Institute on Municipal Finance and Governance, and an Adjunct Professor at the Munk School of Global Affairs at the University of Toronto. Enid has been working on municipal finance issues in Canada and abroad for 35 years. She has published books and articles on property taxes, intergovernmental transfers, development charges, financing municipal infrastructure, municipal governance, municipal boundary restructuring, and education funding. In 2012, Enid was awarded the Queen’s Diamond Jubilee Medal for her work on cities.